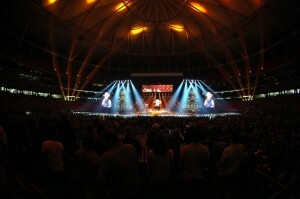 The country mega-star, along with Georgia natives the Zac Brown Band, made a stop in Atlanta on Saturday, August 3rd, to bring the party to nearly 50,000 diehard fans under the roof of the Georgia Dome. 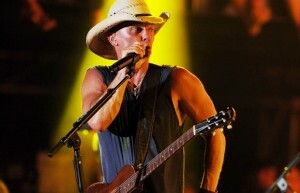 With a total of 42 stadium shows on his “No Shoes Nation” tour, and more concert tickets sold than anyone else in the past 10 years, Kenny Chesney and his touring capacity has reached record-breaking proportions. Of course, with bands this big, there is a lot to be said about concert production. With the use of massive video walls, stadium sized sound and lighting, and various other components dealing with a show this large; it is crucial to have 150+ of the best local stagehands and riggers available. It’s our reputation for providing the industry with some of the best and most reliable crews in the Southeast, that Crew One Productions was called into action. Crew One is always up to the task, regardless of the size of the event, and we are determined to surpass all of our client’s expectations. We are always honored to be a part of a show this big, and look forward to next time!